The upcoming 300 sequel Rise of An Empire has certainly taken its time getting to theaters, but now that its theatrical release is imminent the marketing team behind the movie is creating and releasing poster designs like there's no tomorrow. 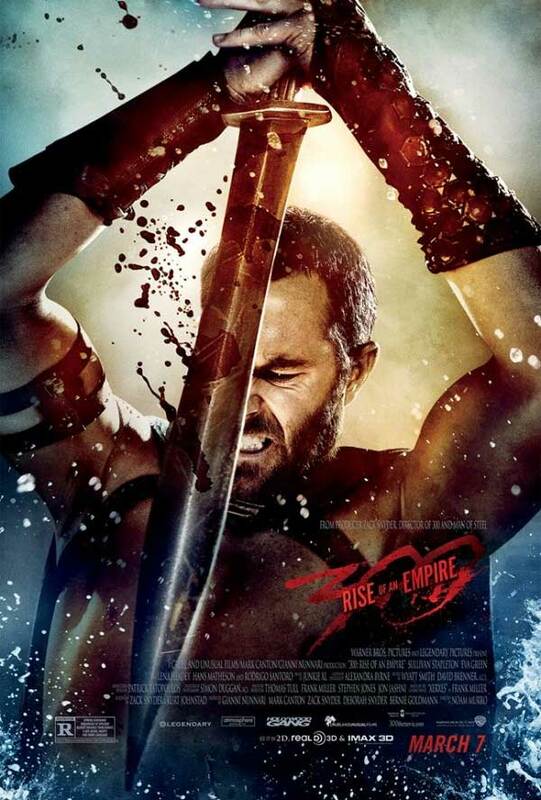 Just last month they produced five separate character posters for the movie, each one showing off a different hero or villain, and today we have yet another brand new piece of artwork, this one featuring Sullivan Stapleton thrusting his sword into what we have to assume is a fallen enemy. After completing production back in 2012, 300: Rise of An Empire was originally supposed to be one of last year's late summer blockbusters - scheduled with an August release date - but eventually that was pushed back until the following March (the same month that the first movie came out and blew up at the box office). That, however, is only a small fraction of the history behind the project. Talk about the 300 sequel/prequel began all the way back in late 2009 when Frank Miller announced that he was developing a new graphic novel called Xerxes that would be the basis of a movie sequel and would tell the origin story of the eponymous Persian god-king. For years there was plenty of people talking about doing the movie, but the project seemed to have an incredibly difficult time finding its way out of development hell. Things finally started to come together in the summer of 2011 when director Noam Murro was attached to helm, and after a lengthy casting process, bringing in actors like Eva Green, Jack O'Connell, Hans Matheson, Callan Mulvey, David Wenham, Andrew Tiernan, Igal Naor, and Andrew Pleavin - production got underway. The film has already released a couple of trailers over the last few months, and you can watch both of them below. 300: Rise of an Empire, which is based on a script written by Zack Snyder and Kurt Johnstad (the same writers as the original), will be in theaters on March 7th. The big question is, do you think it will be worth the wait? Do you think the 300 sequel will be worth the wait?